Portland is in a great location to explore! Students can go on exciting day and weekend trips by car or short flights to some of the coolest cities in the US. New students always want to know about the best places in Portland. PIA has put together some awesome adventures that students can enjoy in the Portland area. Mt. Tabor is a volcanic cinder cone that has been turned into a beautiful city park with hiking trails and water reservoirs. Although it is considered a mountain, it is very easy to walk to the top. From the top of Mt. Tabor, there are lovely views of the city. 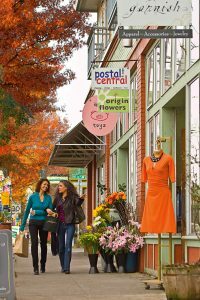 After a mild hike or a picnic under the cherry trees, you can walk west toward the Hawthorne shopping district. There are many great restaurants and shops between SE 42nd and SE 32nd. Grab a snack at New Seasons. Stop off at Blue Star Donuts, rated as one of the best donut shops in the US. Visit the smaller Powell’s Bookstore. Save some money while thrift-store shopping at Buffalo Exchange or Red Light. Find fun treats at gift shops such as Presents of Mind. Entertainment: If you plan ahead, you can catch a musical act at the Hawthorne Theater or a movie at the historic Bagdad Theater. Only four blocks north on Belmont Street, spend some quarters in the Wunderland Games video arcade and see a kid-friendly film for less than $5. By bus, it only takes 18 minutes to get to the Hawthorne District from PIA. Mt. Tabor is right next to the campus! These vibrant art and shopping areas are full of entertainment and activities to fill a day or a night! Start in the Mississippi area for shopping and food. Go to the Rebuilding Center to see a construction recycling center filled with old house parts. Keep walking north to try some yummy food at the vegan food cart of Wolf & Bear’s, or eat at restaurants like Laughing Planet, Gravy, or Mee Sen Thai Eatery. Try out a range of gourmet salts and chocolates at The Meadow. Be sure to have a look around the eerie Paxton Gate, filled with fossils, bones, strange plants, and other oddities. The Alberta arts district starts at NE 14th Street, where you’ll find some delicious food carts on the north side of the street. Try Desi PDX for some gourmet tastes. Then head east to Salt & Straw Ice Cream, where you can try olive oil ice cream and other incredible flavors. Next door is a fun art gallery called Screaming Sky. Keep heading east to more art galleries and shops such as Monograph Bookwerks and Ampersand Gallery. After dark, check out Alberta’s vibrant nightlife in restaurants and bars. Entertainment: Look for music shows at the Alberta Rose Theater, Mississippi Studios, Mississippi Pizza, or The Know. Try some yoga at Blue Sky Wellness, IAM yoga, Full Lotus PDX, or Sun Gate Studios. Check out a movie for under $5 at the Kennedy School, where you can also take a soak in their heated pool. From PIA, you can take a bus for a little over an hour to the intersection of NE Mississippi and Fremont. Then walk north, up the hill on Mississippi Ave. to NE Skidmore Street, where you can either take a bus or walk for 25 minutes over to NE Alberta St. and 14th Avenue. From there, walk east along Alberta St. until NE 33rd Avenue. Visit the beautiful 100-year-old mansion of a wealthy family that had a major influence on Oregon’s culture. The unique home was designed and built by local experts using materials from the Pacific Northwest. After Pittock Mansion, take a trail down the hill into Forest Park to explore. If you want a real hike, head south on the Wildwood Trail for 7 miles. You will end up in the Washington Park area. Otherwise, take a bus or MAX train to the Oregon Zoo stop. In Washington Park, explore the various trees of Hoyt Arboretum, the many roses of the International Rose Test Garden, or the Zen beauty of the Japanese Garden. See the wild animals of the Oregon Zoo, or learn about the timber industry at the World Forestry Center. A bus to Pittock Mansion takes less than an hour and a half from PIA, while a bus and MAX to Washington Park take a little over an hour. A bus between Pittock Mansion and Washington Park takes about 40 minutes. One of Oregon’s most visited sites, the Woodburn Outlets have 110 stores with great discount prices, sales-tax free! Check out Adidas, J. Crew, Calvin Klein, Coach, North Face, Tommy Hilfiger, Disney, or Columbia for great deals on name brands. Only a 45-minute drive from PIA, it’s easy to visit the Woodburn Outlets after classes (on a light homework day, of course). The Gorge is a delightful and beautiful place. Waterfalls stream out of tall cliffs that are covered in trees and flowers. Try a hike on one of the many trails, or drive along the Historic Columbia River Highway—one of the first scenic highways in the US. The Oregon Coast is famous for its beauty and great surfing. Start off in Cannon Beach to see the most famous of the many haystack rocks that line the beaches. Head north to Seaside for a traditional US boardwalk experience in the arcade. Try some seafood in the many restaurants, or go shopping in the galleries and fun stores. The drive to the coast is a little over an hour and a half. A trip to Seaside is only 15 minutes more. Mt. Hood is the tallest peak in Oregon. In the winter, Mt. Hood offers winter sports such as snowshoeing and skiing. In the summer, students can enjoy hiking, fishing, and camping. Seattle is an exciting urban city, surrounded by water, mountains, and evergreen forests in the state of Washington. Some popular sites include Pike Place Market, the Space Needle, the first Starbucks, the Fremont Troll, Kerry Park, and more! It only takes three hours to drive to Seattle from PIA, and it takes less than an hour by plane. Various public transportation options are also available. Want to know more about Seattle? Go to Visit Seattle. San Francisco is in northern California. It is a unique and breathtaking metropolis. Many locations in San Francisco have been used in both US and international movies and TV shows. The Golden Gate Bridge, Alcatraz, and Fisherman’s Wharf are the most popular sightseeing spots. It takes less than two hours to fly from Portland to San Francisco. Want to know more about San Francisco? Go to San Francisco Travel. Los Angeles is a world-famous city in southern California. There are many places students can visit— Hollywood, Disneyland, Santa Monica, Beverly Hills, Rodeo Drive, Venice Beach, and more! It is one of the most vibrant and exciting cities in the US. It is also where many Hollywood celebrities live. It takes a little over two hours to fly from Portland to Los Angeles. Want to know more about Los Angeles? Go to Discover Los Angeles. Las Vegas is a fabulous resort town in southern Nevada. It is known for its 24-hour casinos and endless entertainment options. The iconic main street, called the Las Vegas Strip, is just over 4 miles (6.5 km) long. Many elaborate themed hotels are on the Strip. Also, a spectacular circus group, Cirque du Soleil, performs shows all year long. It takes two hours to fly from Portland to Las Vegas. You can also visit Cirque du Soleil to find out about their shows! From Portland, you can easily visit Vancouver, BC. This ethnically diverse city is near the border with the northwest United States. Although it is a big city, it is surrounded by mountains and attracts many tourists who enjoy outdoor sports all year long. It takes five to six hours to drive to Vancouver from Portland, and it takes a little over one hour by plane. You can also take a bus or ride an Amtrak train. Victoria is located on the southern tip of Vancouver Island. It is a beautiful island with many historic buildings. The city is also known as “The Garden City.” You might feel like you are traveling somewhere in Europe. Want to know more about Vancouver, Victoria, and the rest of Canada? Go to Super, Natural British Columbia, Canada.